Right-of-Way acquisitions in civil engineering encompass a lot of detail. According to Betsy Bosiak, land acquisition specialist at Hoyle, Tanner, it can take a little under five years to learn everything there is to know about Right-of-Way. Betsy recently hosted a Lunch & Learn session at Hoyle, Tanner to answer questions about the acquisition process. For those who may not know what Right-of-Way is, it’s the act of acquiring land or easements to complete a project. It could be anything from a homeowner’s land that needs drainage services near a road to getting new land to build a medical office. As she stated in her presentation, each state has to follow certain federal guidelines, but the individual states do have specific criteria for Right-of-Way processes. In fact, if you take a stroll into Betsy’s office, her bookshelf is home to two thick Right-of-Way booklets: one for Maine and one for New Hampshire, available to anyone in the office who has questions. Betsy’s presentation was about the acquisition process in New Hampshire (one she tried not to get into too much detail about because of its sheer power to overwhelm). Know the basics. 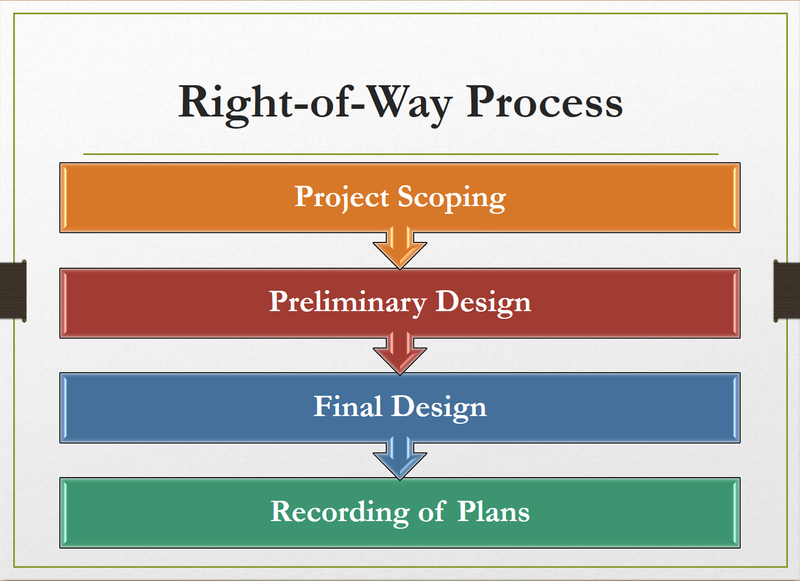 First and foremost, Right-of-Way acquisition is considered a part of the final design process, depending on the size of the project. Yet it’s also important to realize that many items occur concurrent with plan development. 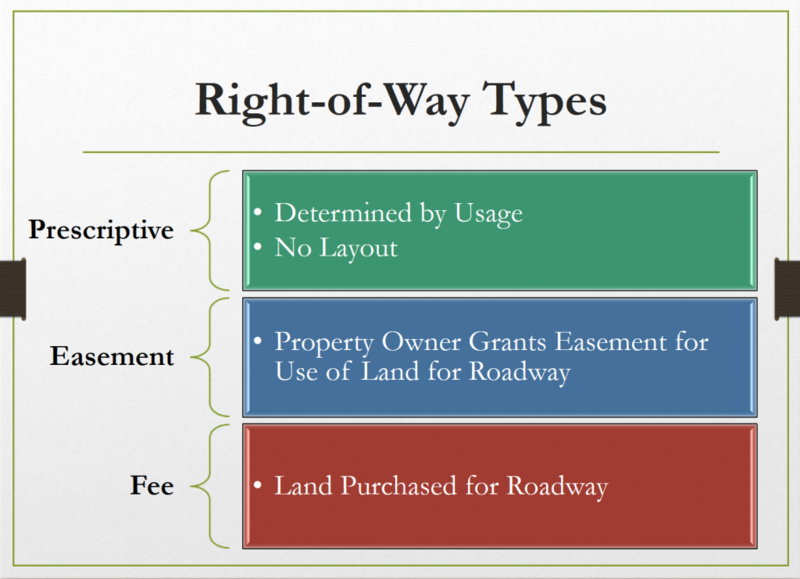 The types of Right-of-Way are Prescriptive, Easement, and Fee. Prescriptive is determined by usage, but there is no layout. Easement acquisition is when the property owner gives easements to allow the use of land. Today, however, the most popular acquisition is fee-based; land is purchased for the project to be completed. Determine what’s already there. It’s vital to determine the existing Right-of-Way by checking existing plans, historic documents, property surveys, deeds, and existing ground conditions. Make a plan & be specific. To actually acquire land for project use, there needs to be a project scope, preliminary design, final design, and recording all plans. Determine the type of acquisition: Fee Taking (buying the land), Temporary Easement (using it for the time of construction), or Permanent Easement (the land is yours forever, but the State or Municipality has easement rights). Explain the impacts. You actually need to explain to the landowner the intended impacts to the property. Public meetings, meetings with officials, and meetings with landowners are a critical part of the process. As Betsy suggests, keep records of what everyone says so that there’s no confusion later in the process. Determine appraisals. Even after the landowner meetings, the land is still n ot ready to be built upon. 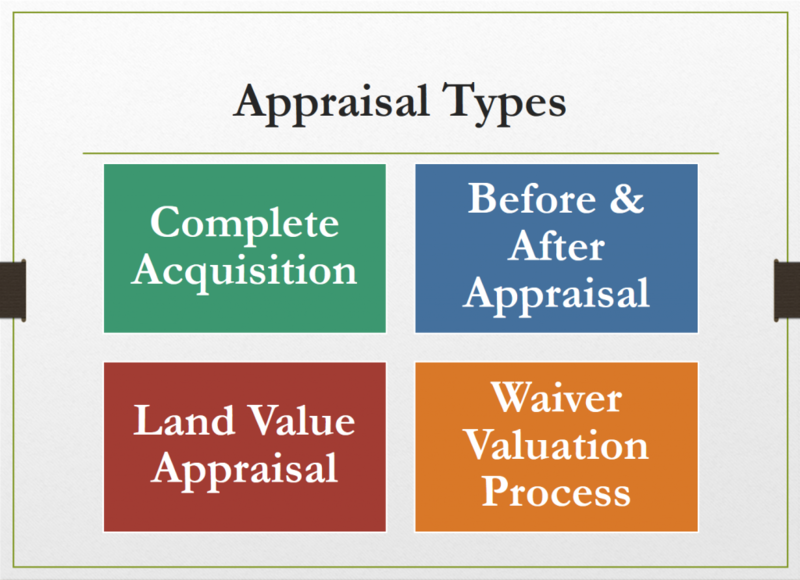 In fact, the next step in the detailed acquisition process is Land Value Appraisals. Once that’s complete, a written offer is made to the landowner. If the landowner agrees to the compensation, the designers can move forward with the appropriate documents and acquire the land. The project can be completed! If not, well, it’s back to the negotiation table. Acquire the needed property rights. The property owner has agreed to the written compensation. It’s time to prepare the deed or easement document, and with a witness or notary, sign the document. Save all written records and notes and make copies of each. The land is officially available for project construction. The Right-of-Way acquisition process is no simple matter (though it was explained in layman’s terms here). It can take anywhere from 1-2 years from preliminary to final design before land is acquired for the project. By then, project designs and abstracts can change multiple times. Betsy recommends documenting files for each landowner and making multiple copies of these documents for reference.